The United States Commerce Department National Telecommunications and Information Administration (NTIA) announced today it found the proposal developed by the global internet multistakeholder community to fully privatise oversight over the central root zone of the internet domain name system (DNS) satisfactory. The proposal met the criteria outlined by NTIA for the transition in March 2014 when NTIA originally stated its intent to transition the US government’s stewardship role for the internet root zone and other core databases, known as the Internet Assigned Numbers Authority (IANA) functions. The NTIA stewardship report is available here. According to the proposal, the Internet Corporation for Assigned Names and Numbers (ICANN) will be the future IANA operator, managing the root zone, the central database for IP addresses for the regional internet registries (RIRs), and the registry for protocol numbers for the Internet Engineering Task Force (IETF). The proposal developed over the last two years by the internet community at ICANN, the RIRs and the IETF had “broad support from the international community,” once listing the conditions for the transition, Assistant Commerce Secretary for Communications and Information and NTIA Administrator Lawrence Strickling said in a press call today. The proposal “will enhance the multi-stakeholder model, maintain the security and resiliency of the internet.” It also would meet the needs and expectations of the global customers of the IANA, preserve the openness of the internet, and it met yet another key condition: “It will not replace the NTIA’s role with a governmental or inter-governmental solution,” Strickling underlined. 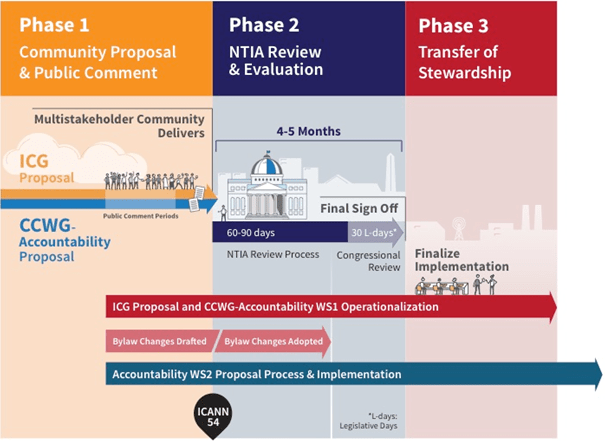 Following a recommendation of the General Accountability Office (GAO), NTIA also has evaluated the new accountability measures developed as part of the transition for the future IANA operator ICANN, Strickling added. An independent panel of experts also declared the new accountability framework as in line with good governance principles. NTIA has now set 12 August as a deadline for ICANN to implement all components of the transition proposal, namely finalising service level contracts with the IETF and the RIRs, and completing an ongoing technical test for direct delivery of root zone changes from ICANN to VeriSign. VeriSign is the acting and future technical background operator – the so-called Root Zone Maintainer (RZM). Observers close to the process have expressed some concern over the fact that VeriSign in the negotiations for its contract with ICANN has acted not so much as a technical service provider, but more as an irreplaceable actor in the system. VeriSign at the same time is the operator of .net and .com – the largest TLD registry. Strickling, when asked on a potential congressional roadblock for the transition, just underlined NTIA’s intent to continue briefing all interested Congress members over the summer. In its press materials, NTIA tried to rebut the argument. “Is the US Government giving up control of the Internet as some have claimed?“, the material reads. A misconception, NTIA says, as the US would in fact not control the internet. Support for the transition, including today’s NTIA assessment, came from various industry and civil society stakeholders. The Internet Society also came out with a supportive statement after the NTIA announcment. "NTIA, ICANN Tick Another Box On Way To IANA Transition" by Intellectual Property Watch is licensed under a Creative Commons Attribution-NonCommercial-ShareAlike 4.0 International License.